Thank you very much! 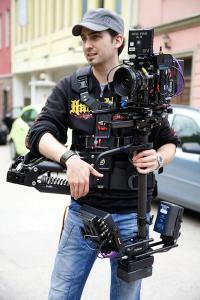 :) :) I remember they adjust the Gimbal once when I had the rig away for service. Is this done with the same screws? So the right one in the circle should be tight and the left one is for the tango? I was confused, because one of the screws was lose... one of the ones you can not really see, because they disappear inside. So I should tighten them? That is what we found out: The Marshall monitor uses one ground for both - sdi and power. So when the sled is powered on (12V or 24V) and you connect the multicable to the monitor first (SDI and power) and connect the multicable to the sled after everything else is connected, the plus-pin might have contact before the minus-pin. So the power runs from the battery through the SDI line into the SDI-board, to the the multicable. That is my theory. I can not prove it. But do you think that is possible according to your cases? Greetings from Munich! Hey guys! Thanks alot for all your thoughts. I also talked to the guys from Betz-Tools in Munich and we might found out what happened, after opening the monitor and checking different options with the multimeter: I had the rig powered on. The Marshall has only one ground line internal. This is for the power and the signal way. When connecting the multi cable to the rig, the +-connector maybe had contact before the ground connector. So the circle was closed and the electricity went through the signal way back to the battery. That is the theory so far. Hey Jerry, I had one battery on the back of the Archer 2 mount and a second battery down under the post. The transmitter was connected to the battery mount on the back by D-Tap connector. Is it possible that switching to 24V created the short? The monitor was turned off. Is that the solution? Hey Janice, thank you for your thoughts. 1) I do not know who made the cable. I bought it with the used rig. It worked well for the past time... 2) Yes, I can read a multi-meter and so on. 3) May it become a problem when the rig sends 24 volts and there is a battery on the monitor when it is turned off? 4) Do you have an idea where to get the wiring info? I can not find more then the connector pin info, but I do not know what is inside the post... 6) I'll do my very best and I really want to understand what happened. 7) Should I replace the cable? I checked it with the multi-meter, but everything looks fine. 8) I also opened the monitor and searched for the damaged area. When I remove the HDSDI-module, the buttons react and I can change the source and so on, but the screen stays black. Thank you so far!